Weddings are special days, and we feel they should be magical. 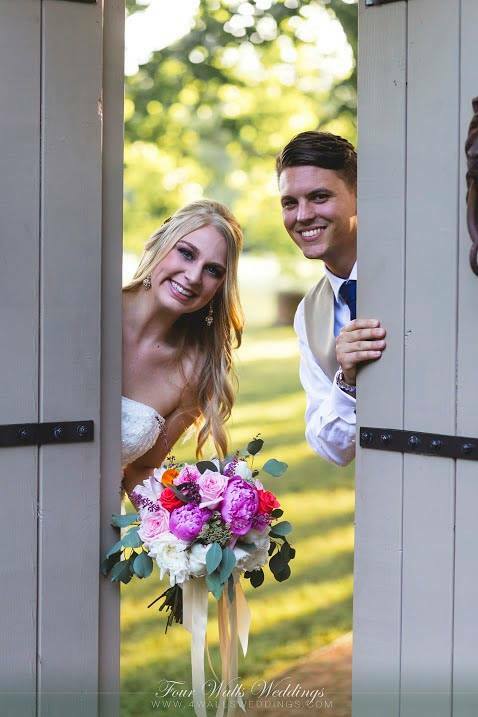 Have your Outdoor Country Wedding at River Road Chateau – Rustic Wedding Venue, where we blend rustic Texas chic with class and traditional Southern charm. The Chateau With 4,500 square feet of dedicated space, the Chateau is the perfect wedding reception location to dine and dance the night away. The Grand Hall, with its five foot wrought iron chandeliers, textured cream walls, and walnut-stained doors, also features 3,600 square feet of open space for wedding party and guest table set up. The quaint Bridal suite and Groom’s room sit opposite one another and have décor and accoutrements suitable for each. There’s a fully-equipped warming kitchen with bar service opening to the east patio, and guest bathrooms are just off the west. Eight doors line both sides of the hall and slide open for guests to enjoy both patio areas. 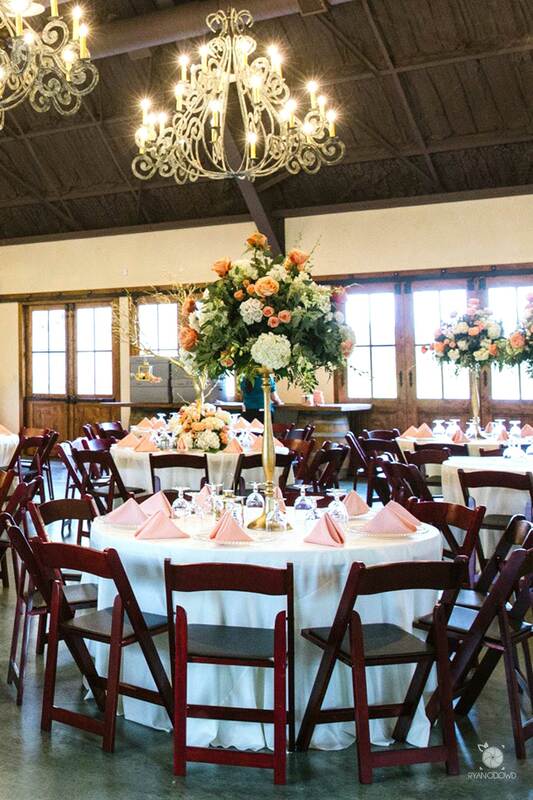 With a tall, wooden altar canopy and copper tabletops fastened to oak barrels, the Chateau offers a rustic wedding venue full of charm and elegance. Wedding Meadow Down the Jasmine path, across the Bridal bridge, lies a circular clearing surrounded by towering Oak, Sycamore, and Elm trees. This shaded space, with the rustle of leaves and faint scent of Honeysuckle, is our Rustic Wedding Venue Meadow. Guests cross the bridge and are immediately entranced by the tranquility of nature. Mahogany guest chairs and shepherd’s hooks border the center aisle leading up to the chandelier-adorned wedding arbor where couples exchange their vows. 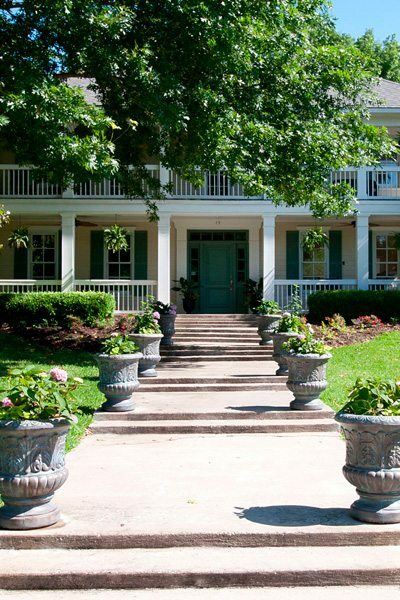 Belle Manor Our newly renovated guest house is available for rent by wedding parties and their guests. Designed straight out of Southern Living, this replica Carolina plantation home boasts 4,500 square feet of living area and will accommodate up to 13 guests. A gorgeous bridal suite is available to the wedding couple, allowing them to mingle with family and friends until the end of their reception, yet have a luxurious bed to fall into just a few hundred feet from The Chateau. Remaining guest rooms can be rented for the bridal party or out-of-town family and friends, allowing them a cozy, private alternative to a stay in a distant chain hotel. River Road Chateau – Rustic Wedding Venue allows you the flexibility to design your dream wedding. We provide the venue-canvas, your style and creativity paints the picture of the perfect day. Included in your rental are 20 round 60” tables (tablecloths are available for rental or you may arrange for your own), 200 padded mahogany chairs, and several serving tables, including 3 copper table tops set on wine barrels, an 8-foot and two 4-foot wooden table tops also set on wine barrels, a remote screen and projector, indoor and outdoor sound systems, and a golf cart to carry the bride (and any guests who might require special assistance) to and from the wedding meadow. Caterers have full access to our warming kitchen. Also included in the rental are water and wine glasses (200 each), as well as carafes that you may fill and place on the guest tables. Our staff will bus your tables following dinner and cake, and throughout the evening to clear away empty glasses or cans. 200 padded mahogany chairs, a chandelier-lighted arbor and an outdoor sound system (including a lapel and/ or stand microphone for the officiant), and 14 wrought iron shepherd’s hooks are provided to you in the wedding meadow. For our full list of offerings and cost, you may download our Amenities and Pricing document. Do you provide discounts for military and first responders? As a way of showing our appreciation for your dedication, service and sacrifice to your community and country, we are pleased to offer the following discounts to bridal couples who are military and first responders. River Road Chateau – Rustic Wedding Venue can provide a list of our Preferred Vendors which includes caterers, florists, photographers, etc. with a proven track record of quality, reliability and affordability. Brides have the option to choose from this list or select their own with no associated fees. Vendor contracts are between the bride and the vendor and separate from your rental contract. Is there an onsite manager? There will be a manager and/or venue concierge onsite throughout your entire rental period. The reception hall will be set up to your specifications when you arrive, but our staff are available to make changes if necessary. Our managers are not wedding coordinators (you are welcome to hire and bring one of your own with no associated fee), but are there to answer any questions you may have, provide direction and support, and monitor contract compliance to ensure the safety and enjoyment of all parties. During your event, the venue concierge will monitor the environment (temperature, lighting, check restrooms to ensure cleanliness and sufficient stock of toilet paper, paper towels, etc. ), as well as supervising and assisting the bussing staff. Do not hesitate to reach out to any one of our staff members if you have questions or concerns. We are there to help your day go smoothly and allow you to relax and enjoy your wedding. Alcohol (beer – including kegs/wine/liquor) MUST be served (NOT sold) by a TABC-certified bartender; bartenders must complete a hold-harmless waiver and provide proof of liability insurance. All beverages must arrive and remain in ice chests until served. TABC requires 1 security officer for each 100 guests (1 officer for 0-100, 2 officers for 101-200). Contact information for uniformed officers will be provided to you. You (or your caterer) will need to provide your own service ware: plates, cups (if you choose to have additional options outside of the water and wine glasses), napkins, serving pieces, etc. BE SURE you ask your caterer if they will provide forks for the cake; if not, you will need to bring these. You will provide your own décor items; it’s a good idea to have a designated person to supervise and coordinate the decorating. You may use candles, but fire code requires there be 3” of glass above the top of the flame. You are responsible for contracting directly with the vendors and providing the appropriate waivers/releases, food certifications and proof of liability insurance (this is standard in the industry and you should not have any issues obtaining this paperwork from the vendors). 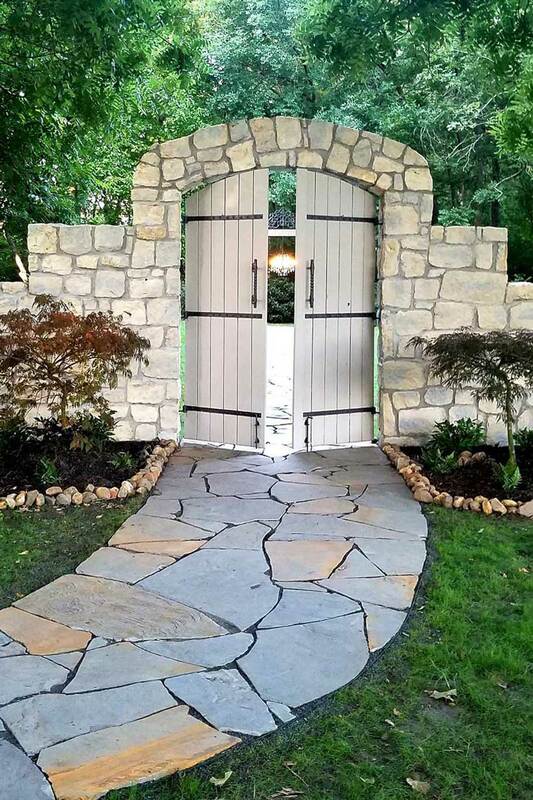 River Road Chateau – Rustic Wedding Venue will complete a Wedding Day info sheet that will include contact information for your vendors as a courtesy to you, in the event one needs to be called the day of the event. We are not responsible for making any arrangements or contact with your chosen vendors. Payments are split into 4 installments and are each due on the 1st of the month; the first installment is your down payment and secures your requested date. It is refundable up to 6 months prior to your event date. The second installment is due 6 months prior to the event, the third is due 3 months prior and the final payment is due one month prior to the event. Contract payments may be made by cash, check or credit card. A $500 security deposit is required on a credit card 3 days prior to the event and is fully refundable upon satisfactory inspection of the facility and grounds. You will be billed for any cost of damages incurred above the deposit amount.